BEIJING — Nineteen coal miners trapped for more than 24 hours after a gas explosion and raging fire in a mine in Hegang, in northeastern China, are presumed dead, the state-run broadcaster CCTV reported on Thursday. 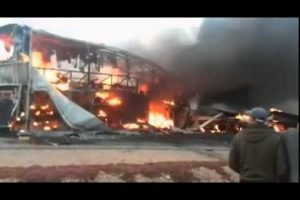 The explosion on Wednesday afternoon initially trapped 52 workers, but 33 were rescued, CCTV said. The blast site remained on fire on Thursday and the temperature inside the mine “could have reached 1,000 degrees” Celsius (more than 1,600 Fahrenheit), he said. Several large coal mines run by the Longmay Group, a state-owned company that has threatened to lay off 100,000 workers, are scattered around the city of Hegang, which is in Heilongjiang Province. Last month, 22 workers died in a fire at a Longmay-owned coal mine in Jixi, about 150 miles south of Hegang. Longmay was severely criticized by work safety authorities for poor supervision, failing to repair conveyor belts in the mine and waiting nine hours before reporting the fire to the relevant authorities. But the mine where Wednesday’s explosion occurred is a small, privately owned operation, according to a former Longmay mine worker who was reached by telephone. The worker gave only his surname, Ma, for fear of reprisals. Such accidents are common in Hegang, especially in private mines where safety procedures are more lax than in larger, state-run mines, Mr. Ma said. Sometimes deaths go unreported, Mr. Ma said. Morale among workers in Hegang has been shattered by the announcement in September that Longmay, which is owned by the Heilongjiang Province government, planned to lay off so many workers. Since then, some safety procedures have been curtailed, because safety inspectors were among those already laid off, mine workers said in recent interviews. In November 2009, 108 miners were killed in an explosion in a Longmay-owned mine in Hegang.